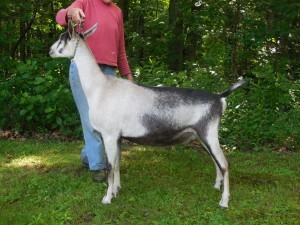 SD: GCH Chateau Briant’s Juni 9*M 5-4 FS 92 (E E E E) • 6 GCH daughters!! D: GCH Chateau Briant’s Jovial 10 *M 3-4 FS 91 (E E E E) 3rd place 4 year old and 1st place dam and daughter, 2014 National Show! 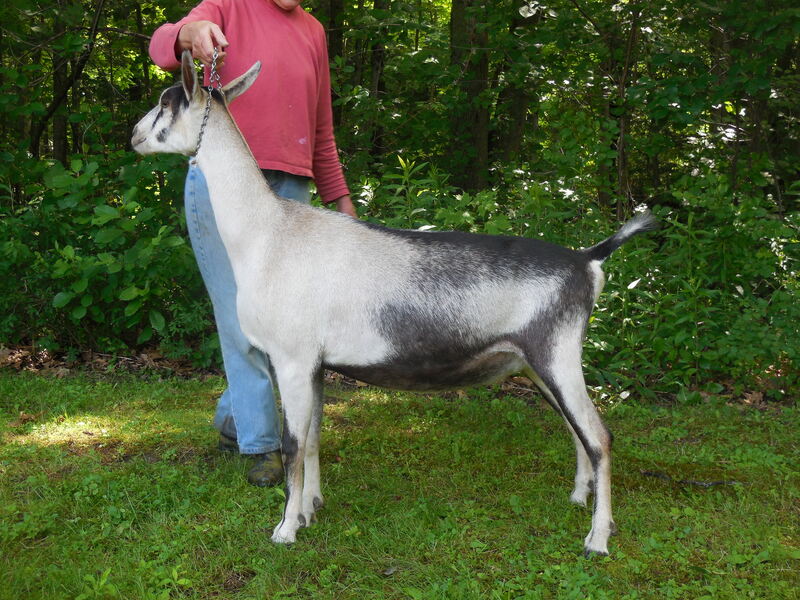 While we have rarely purchased doelings, we could not resist this proven line breeding incorporating some of Chateau Briant’s best genetics with our Roeburn’s KVLW Samurai out of ++*B Kickapoo-Valley Lord Wimsey (Petey) and GCH Sheba. Jujube has not disappointed!!! She freshened with a gorgeous and well balanced mammary system, high in the rear, beautifully blended in the fore, with ideally sized and placed teats. 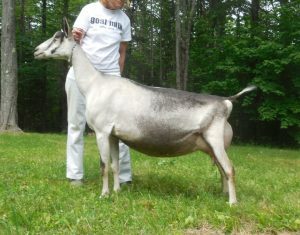 Shown once this season, she placed first in her class. 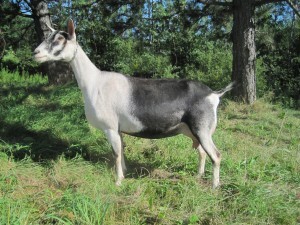 Moreover, her production has been impressive, milking as well as a first freshener as some of our mature does. Jujube’s full sister, Joyanna, has already attained her championship and appraised FS 89 (E V E E) as a first freshener! 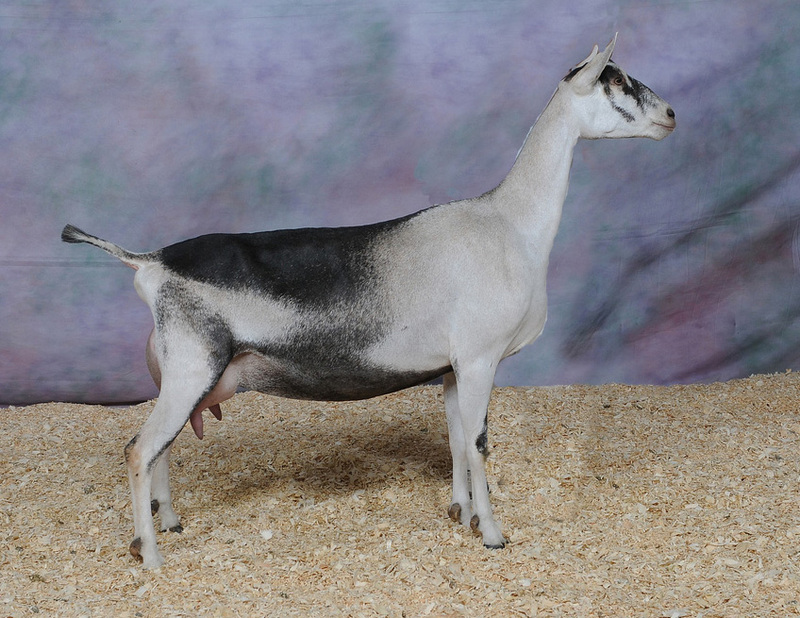 We were very excited to hear that Jovial and Joyanna won 1st place dam and daughter at 2014 National show! We feel that Jujube shows excellent potential as well, with her width throughout, her beautifully level topline, and her impressive dairy style. Shown for the first time at the Southern VT DGA show in June 2014, Jujube placed 2nd and Reserve Junior Champion! 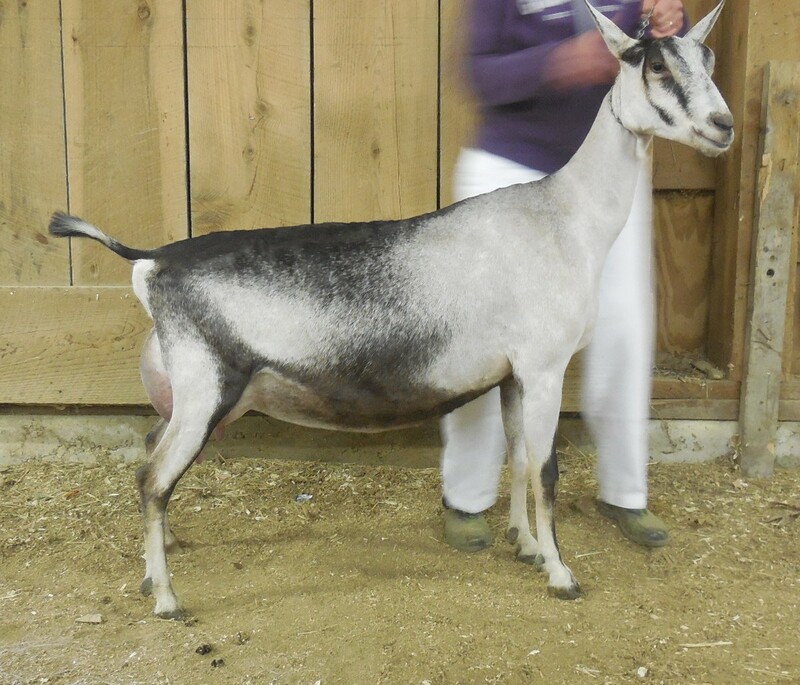 She won her dry leg at her final show in 2015. We were disappointed to get her to only one show in 2016, as she freshened with such a gorgeous mammary, very high and arched in the rear, and blending so smoothly in the fore. In addition, Jujube is one of our best producers. In her one show in 2017 she placed 2nd to Meribel. We were very pleased with her well deserved FS 90 in August 2017! Photos below are Jovial as a first freshener (L), Jujube as a dry yearling, full sister Joyanna (below Jovial), and her sire, Jaylen.